Promising 300 days of quintessential sunshine, Quinta do Lago—located on the southern coast of Portugal— is one of Europe's most wonderful destinations, boasting more than 2,000 acres of verdant countryside where the sweet aroma of centuries-old pine forests meets the Atlantic Ocean. An increasingly popular tourist hot spot, golfers, water sport enthusiasts and sunbathers all flock to the warm and radiant temperatures of the Algarve. Explore the boutiques and restaurants, or venture to the outskirts of Almancil and discover the Church of Sao Lourenco, beautifully adorned with glazed blue tiles (azulejo) tiles. Nestled peacefully amid lush gardens, Vilar do Golf sits in the heart of the Quinta do Lago estate, beckoning travelers to escape to its quiet and stylish accommodations. Offering substantial space and modern appointments, the resort is a comfortable retreat, ideal for a romantic getaway or a family vacation. Enjoy the superb leisure and sports facilities, championship golf courses, two restaurants and nearby nightclubs, all skirted by miles of golden sand. Our comfortable one and two bedroom accommodations feature a modern bathroom with hair dryer, complimentary amenity kits, shaver point and a heated towel rail. The fully equipped kitchen offers a microwave, dishwasher, toaster, refrigerator and many other conveniences. Additional in-room amenities include a television and DVD player. All accommodations feature a lovely balcony, patio or terrace. Driving: Driving from Spain (your journey will take approximately 1 hour): passing the bridge (border) you'll reach the A22 road. Continue on this road (around 45km) and take the exit to Almancil. Passing Almancil roundabout, take the 1st turn left and then the 1st right. Take the left fork at the junction signposted "Quinta do Lago". This road takes you to Quinta do Lago roundabout with a “Q” in the centre. Go through the estate entrance and continue until you reach roundabout number 4 where you will find Vilar do Golf on the right hand side. Directions to Resort: Take the airport exit road, continue on this road and turn right 2nd exit to Portimão/Lisboa/Loulé, then follow the signs for Portimão (not Faro) onto the EN125. Continue on this road for a further 4.8km and take the first exit road sign posted “Almancil” (EN125). Travel for approximately 4 or 5km and take the next exit road for Almancil, 250 meters after S.Lourenço Church. Continue into the centre of Almancil and turn the 1st left after the roundabout. Take the 1st turn left and then the 1st right. Take the left fork at the junction sign posted “Quinta do Lago”. This road takes you to Quinta do Lago roundabout with a “Q” central feature, go through the estate entrance and continue until you reach roundabout number 4 where you will find Vilar do Golf on the right hand side. Please note that the traffic in Almancil centre is being diverted due to road works. Please follow the signs. Kennel: Loulé, Monte Verde, 00351 289 413 113; 8km from resort. Shops hours from 9:00 to 19:00 in most towns, closing for lunch from approximately 13:00 until 15:00. As part of our continuing efforts to maintain and enhance our resort, there will be villa refurbishment ongoing from January through to December 2019. Guest allocation during this works will be taken in consideration to be as far away as possible from the working area. There will be exterior lighting renovation, garden and tree maintenance works from January 2019 through to the end of December 2019. The noise level will be medium and works will be done from 10am to 5pm. Construction Vehicles, transport of materials and personal, grounds waste and renovation, areas proper boarded. The indoor pool and whirlpool will be closed for maintenance from 1st until 10th September 2018 . The outdoor pool will remain available for guests to use. There will be noise, dust, and construction workers/equipment during the hours of 10 a.m. to 6 p.m. Please note that it is compulsory to wear swim caps in the indoor pool. Please ask at reception for more details including where to purchase. ILVero is the new Italian restaurant located at Vilar do Golf. Featuring a mouthwatering range of delicious food and a special pizza menu, ILVero promises a taste of Italy in a relaxed and stylish environment. Opening Times: Daily from 5pm to 10pm. NOA CAFÉ, located next to reception, overlooks the magnificent Quinta do Lago Golf Course. Open for breakfast and lunch, it offers a balanced menu, rich in flavour and freshness, ideal for those looking for a home-made, light and healthy meal. For lovers of good coffee or natural juices, NOA Cafe is the best choice! o Opening Times: Daily from 8am to 5pm. Check In Day: Our main check-in day is Thursday & Saturday; however it may be possible to check in on alternative days subject to availability. Prior to checking in: Please help us to make your check in as efficient as possible by advising us in advance of your flight details and arrival time. The nearest town (Almancil) is located 6km away from the resort. There is a limited scheduled public bus; therefore we recommend that you hire a car. Please note – hen/bachelorette and stag/bachelor party bookings will not be accepted. The resort applies this policy strictly. Should a reservation be made for guests in a hen/bachelorette or stag/bachelor party, the party will not be able to check-in and will not receive a refund. Should your conduct or that of any of your party during the course of your stay give resort management cause for concern, an additional payment of €1000 will be required by way of security deposit. This deposit will be refunded to you in full at the end of your stay provided that no damage has been caused. 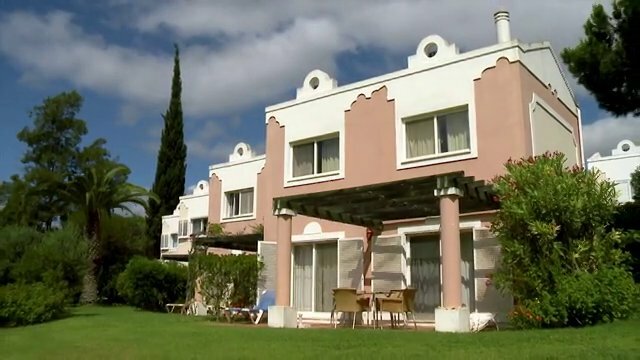 In serious cases, the resort reserves the right to evict guests whose anti-social behaviour affects the family-friendly atmosphere of the resort. When booking 5 rooms or more, different policies and additional supplements may apply. Please contact the resort in advance for further details. If you intend to arrive later than the check in date/time stated please notify the resort as soon as possible. Accommodation will only be held for 24 hours after the arranged check in time unless the resort has been notified of your late arrival. When checking in: Please provide your confirmation letter, picture identification and/or passport as required. All guests must present their passport as a police form needs to be completed. Hotel guests are required to pay a refundable security deposit of €100 per apartment upon arrival. This deposit is obligatory and must be paid with a valid debit or credit card. Please note that cash is not accepted. Guests who are unable to provide the deposit will not gain entry to the apartment. Please note that we have a porter service available on check-in day. Highlights: Superbly located amid landscaped gardens, Vilar do Golf was created for those who love to relax in a natural environment. As its name suggests, Vilar do Golf is a golfer's paradise being located on 18 hole championship golf courses of Quinta do Lago, in the Ria Formosa Nature reserve. The resort is positioned on a hill with various gradients and inclines around the site. Access ramps have been adapted to assist wheelchair on the entrance to the pool and when accessing reception, supermarket and Birdie Lounge area. Accessible by ramp. Lowered Reception desk. Automatic doors. Accessible toilet. Induction loop. Accessible by ramp/steps. Accessible toilet. Pool activities area on one level which is accessed by ramp. Accessed by steps. No ramp available. Accessed by two steps. No ramp available. Accessible and on one level. Accessed by ramp and lift. Accessible bathroom. Street level, easily accessible and accessed by ramp. Located in reception, easily accessible. Accessed by one step. Portable ramp available. Designated accessible parking spaces are available outside reception, restaurant and pool area. Wheelchair accessible accommodation has allocated parking space near to accommodation. We offer 1 accommodation in total: 1 one-bedroom accommodation. One-bed accommodation: Two units are at street level with small step to entrance, one level throughout. Two units are located on the first floor. Two-bed accommodation: All units are at street level with small step at entrance. All units are on two levels, living areas downstairs and bedroom and bathrooms upstairs. The big attractions at Zoo Marine are the spectacular presentations. The dolphins are perennial favourites, with a breath-taking demonstration of the dolphins’ agility, intelligence and the special bond they have with their trainers. The Wonderful World presentation features seals and sea lions, sailors and lost treasure. This show gets lots of laughs from the audience and is definitely one that the kids will enjoy. The Enchanted Forest presentation with tropical birds is entertaining while at the same time promoting environmental awareness – always a priority at Zoo Marine. The birds of prey presentation is dramatic and awe-inspiring, and allows you to get closer to these majestic creatures than you ever thought possible. Ramps, bathrooms adapted and wheelchair available. Slide and Splash is one of the leading Algarve attractions and should be on your list of things to do in Portugal. It's a day of sliding down the Kamikaze or the Black Hole and splashing in the Olympic-sized pool. The park is good for children of all ages, particularly excellent for the little ones. Ramps, bathrooms adapted and wheelchair available. Aqua Show family park is set in large grounds with plenty of grassy shaded areas for relaxing. There are several kid’s play areas with slides and swings scattered throughout the park. One of the most popular attractions is the large wave pool, good for adults and kids. The children have a well-equipped pool area with lots of slides and tunnels and some of the larger curving slides are good for children too. Ramps, bathrooms adapted and wave pool access. Catamarans with wheelchair facilities and marina entrance accessible. The nearest fully accessible beach is Quarteira which is located 10 km from resort. Quinta do Lago is accessible. Quinta Shopping Centre is accessible and is located 3 km from resort. Public transport is not adapted however an adapted taxi or minibus can be booked at the resort reception. Unidade de Hemodiálise - Serviço Nefrologia Rua Leão Penedo 8000-386 FARO. Centro Médico Nacional, Parques das Amoreiras II, Lote B 8000-000 FARO.